The origin of the Afghan Hound is uncertain. Prior to European penetration into Afghanistan, the Afghan Hound was kept by tribal chieftains. The tribes were isolated in the various valleys of Afghanistan, which kept the Afghan Hound clear of crosses with other breeds. The use of the Afghan Hound for hunting in the mountainous terrain of Afghanistan required a dog that was highly intelligent and could survive by hunting on its own. The particular characteristics that distinguish the Afghan Hound from his desert-dwelling relatives enabled this breed to survive in the wide range of temperatures and the mountainous terrain of Afghanistan. The first Afghan Hounds arrived in Great Britain with soldiers returning home from military service in the eastern Empire during the early 1900’s. 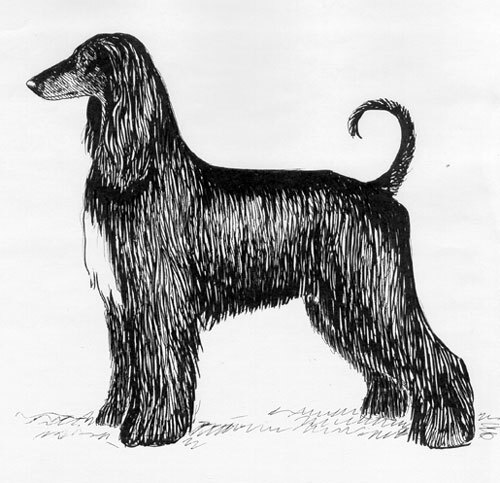 After the first Afghan Hound created a sensation at the Crystal Palace show in 1907, the breed virtually disappeared in England, largely due to the hardships imposed by World War I. The breed was revived in Great Britain after World War I and developed through two influential lines, the Bell-Murray dogs and the Ghazi hounds. A number of British-bred Afghan Hounds were exported to the United States in the 1920’s and became the foundation of the breed here. The Afghan Hound was recognized by the United Kennel Club in 1948. The Afghan Hound is a medium-sized sighthound whose appearance gives the impression of strength and activity, combining speed with power and agility - in short, an efficient hunting dog, albeit a glamorous one. The Afghan Hound is a unique blend of substance, elegance, and function. The head and neck are long, ears are long and pendant, and the tail is long with a ring or curve at the end. The head is held proudly. The correct relationship of length of body (measured from prosternum to point of buttocks) to height (measured from withers to the ground) is 1:1. The coat is long and silky on the ribs, fore- and hindquarters, the flanks, and the top of the head, while the foreface and the back are covered with short hair. The upper tips of the pelvic bones are prominent. In evaluating this breed, it is important to remember that the Afghan Hound hunted its quarry over rough and mountainous ground full of crags and ravines. For this purpose, a compact and well-coupled dog is required, rather than a long-loined racing dog whose first quality is speed. The characteristics that distinguish the Afghan Hound from all other dogs are the long, silky topknot; the sloping croup and low tail set; the prominent pelvic bones; the sparsely coated tail with the ring or upward curve at the end; the unique coat pattern; and the “oriental” expression - inscrutable, piercing, and wise. The Afghan Hound is a strong-willed, independent thinker who is dignified and aloof with strangers. With family, however, this breed can be exuberant and playful. The Afghan Hound does not respond well to harsh training methods and prefers to do things his way. This breed has a very well-developed chase instinct. Regular grooming is required to maintain the glamorous Afghan coat. The head is long and refined but not too narrow, with a prominent occiput and a barely perceptible stop. The distance from occiput to stop is equal to the distance from the stop to the end of the nose. There is a slight median furrow running from mid-muzzle to between the eyes. The head is finely molded and well chiseled with tight, fine skin. The skull is longer than wide, and viewed from above, tapers slightly toward the stop. The occipital bone is very prominent. The hair on the skull is long and silky, forming the characteristic topknot. Faults: Skull too coarse or too narrow; extreme falling away of backskull; absence of prominent occiput; absence of topknot or receding topknot. The muzzle is long and, viewed from above, tapers evenly from the stop to the nose. Viewed in profile, there is a slight prominence of the nasal bone structure causing a slightly aquiline appearance. There is a slight falling-away under the eyes ensuring clear, unimpaired vision. The jaws are long, powerful, and deep. The bones and surface blood vessels are clearly visible through the skin of the well-chiseled muzzle. Lips are tight with no hint of flews. The hair on the muzzle and foreface of a mature Afghan Hound is short but puppies carry heavy facial hair known as “monkey whiskers” until about one year of age. Some Afghan Hounds have a refined beard, called a “mandarin,” on the lower jaw, which adds to the oriental expression. Faults: Weak or receding underjaw; snipy muzzle; exaggerated Roman nose. The Afghan Hound has a complete set of large, evenly spaced, white teeth meeting in a scissors or level bite. Faults: Undershot or overshot; missing teeth; incisors crowded as a result of a too-narrow jaw; wry bite. The nose is black and of good size. Nostrils are large. The nose projects somewhat over the mouth so that a line drawn from the tip of the nose to the end of the lower jaw slopes downward and backward. Fault: Nose any color other than black. Shape of the eyes is very important to establish correct Afghan Hound expression. The eyes are triangular and set obliquely. Dark brown is the preferred color but lighter shades of brown are acceptable in light-colored dogs. Eye rims are black. Faults: Round eyes, giving a pleading expression; yellow eyes; visible haws; eyerims any color other than black. Ears are pendant and set on a level with the outside corners of the eyes. The ears are long enough to reach to the corner of the mouth. Ears are heavily feathered. The neck is long, strong, and arched, blending smoothly into well-laid-back shoulders. The neck is carried high whether the dog is moving or standing. Faults: Neck carried too high, forming a 90-degree angle with the topline; neck too short or too thick; ewe neck; goose neck; neck lacking in substance. The particular structure of the fore- and hindquarters are designed for hunting in rough terrain, which requires both power and agility. This must always be considered when evaluating the structure of this breed. The shoulder blade and upper arm are extremely long and of apparent equal length. The shoulder blade is laid back at an angle of 55 to 65 degrees and forms an angle of about 110 to 130 degrees with the upper arm. When properly angulated, the elbow will be in a direct vertical line below the uppermost tip of the shoulder blade. The forelegs are long, straight, and strong. The pasterns are long, slightly sloping, strong, and flexible. The elbows are close to the body. Faults: Short legs; short, weak, or knuckled-over pasterns; upright shoulder blades; short or upright upper arm. A properly proportioned Afghan Hound is square, with the length of body (measured from prosternum to point of buttocks) equal to the height (measured from the withers to the ground). The withers are clearly defined but not prominent. The back is level, well muscled, and of moderate length. The loin is muscular and broad, supple, and slightly arched. The croup is long and sloping. The tips of the pelvic bones are prominent and set wide apart. A line drawn from the top of the withers to the top of the pelvic bones would be level. The ribs extend well back and are moderately sprung out from the spine, then curving down and inward to form a deep body. The chest is deep, extending nearly to the elbows, and moderately wide, in balance with the width of the hindquarters. The underline starts to rise after the sternum bone, in the area of the floating ribs to a well tucked-up belly. Prominence of the pelvic bones is not to be achieved by keeping the dog too thin. A properly constructed Afghan Hound will have prominent pelvic bones and a well-muscled back. Judges should penalize Afghan Hounds with more than three prominent dorsal vertebrae. Faults: Sloping topline; swayback; narrow or shallow chest; slab sides; poorly defined tuck-up; narrow or roached loin; lack of prominent pelvic bones; more than three prominent dorsal vertebrae. The hindquarters are powerful and well muscled. The angulation of the hindquarters is in balance with the angulation of the forequarters. The upper and lower thighs are long and of approximately equal length. The hocks are well let down. The angulation of the stifle appears to be exaggerated because of the profuse leg hair hanging from the upper and lower thigh. Viewed from the rear, correctly muscled hindquarters appear to be slightly curved from the crotch to the hock but there is no curvature of the bone. The hocks are straight and parallel to one another. Viewed from the side, the rear legs are set so that a line dropped from the point of the buttocks will just touch the front of the rear toes and the hocks are perpendicular to the ground when viewed from either the side or the rear. Faults: Over-angulated stifles; too long a second thigh; narrow rear; straight stifles; long hocks. Afghan Hound feet are perfectly designed for agility in rocky terrain so correct feet are essential to this breed. The forefeet are very large with arched toes and the pads are thick and well down on the ground. The rear feet are as long but not quite as broad as the front feet. All four feet point straight forward. The feet are covered with long, fine-textured hair. Faults: Small feet; absence of hair on feet; feet turned inward or outward; thin pads. The tail is long, and set low, about two-thirds of the way between the top of the pelvic bone and the point of buttock. The tail is curved upward and forms a ring or curve at the end. When the dog is moving, the tail is carried high but not curled over the back. The hair on the topside of the tail is short; the hair on the underside of the tail is long, silky, and sparse. A correct tail is an essential breed characteristic. Faults: High-set tail; straight tail; tail curled too far over the back. The Afghan Hound coat pattern evolved in a land where the temperature can fluctuate widely in a single day. The coat on the fore- and hindquarters, legs, ribs, and flanks is dense, long and silky. There are patches of short hair on each side of the neck forward of the shoulders that are generally covered by the profuse neck coat. From the shoulder backward across the top of the back, the coat is short and close. The hair on the head is long from the forehead backward forming the characteristic topknot. The hair on the foreface is short. Some Afghan Hounds have a refined beard, called a mandarin, on the lower jaw, which adds to the oriental expression. The ears and the feet are heavily feathered. The front of the pasterns and/or hocks may be covered with short hair forming "cuffs.” The hair on the top side of the tail is short; the hair on the underside of the tail is long, silky, and sparse. The Afghan Hound is presented in a natural condition and trimming to artificially create the characteristic coat pattern is to be strongly discouraged. Faults: Absence of short-haired saddle in a mature dog; absence of topknot. All colors are acceptable but white markings, such as a blaze on the head or white on the feet or tail tip, are undesirable. Blue Afghan Hound puppies should not be penalized for a white spot on the top of their heads since this normally fades away at maturity. Desirable height at maturity is 27 inches for males and 25 inches for females, plus or minus one inch either way. A 27-inch male in good condition weighs about 60 pounds, while a 25-inch female in good condition weighs about 50 pounds. Although the Afghan Hound is evaluated at the trot, it must be remembered that the natural gait of the Afghan Hound is the double suspension gallop. When trotting, the Afghan Hound moves with a smooth, elastic, springy stride that differs in two respects from the “natural” trot of herding dogs. First, the Afghan Hound carries its head proudly when trotting, rather than bringing the head down almost level with the back. This proudly carried head is slightly out in front of the body when the dog is moving. Dogs who carry their heads so high they appear to be looking upward will have excessive lift in front and are to be penalized. Second, the feet are lifted somewhat higher off the ground than a herding dog. A hackney gait is a serious fault. Afghan Hound movement is smooth, effortless, and powerful with great freedom of action. An Afghan Hound in motion gives the impression of controlled power ready to spring forward into a double suspension gallop. Faults: Head carried too high or too low when moving.